Feeling like you're in an exercise rut? Give aerial yoga a try. Who says fitness can’t be fun? OK, if not fun exactly, then at least not boring. For those looking to get out of a rut or get back into the gym, there’s no shortage of alternative exercise classes here in New Hampshire. From cycling and barre to indoor surfing and drumming, if you need a change, the options are plentiful. There are even a number of gyms offering aerial yoga, including Kama Fitness in Manchester. The instructors at Kama want working out to be fun — not something you have to force yourself to get through. In addition to increasing strength, balance and endurance, there’s the undeniable beauty and grace of yoga in the air. You can learn more — or, if you’re convinced, sign up for an intro class — at kamafitnessnh.com. 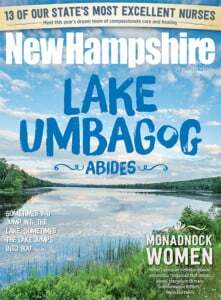 Learn about other fitness trends in New Hampshire from drumming to indoor surfing.